I'm close to putting together all the equipment I want for my Mat'ha Raptor (then I start the process of upgrading everything). The only thing I have yet to pick up is an engine. I've been looking over the options and would appreciate feedback from the more experienced captains out there. This is the one I see most recommended in the builds I have looked at. The bonus to attack patterns seems nice. I do use AP A,B,O but is the bonus that significant? High flight speed and turn rate but more important +5 shield power plus another +7.5 shield power with increased bonus at low power. Now I don't expect to get much of the low power bonus but even if 7.5 is the minimum, does that mean total +12.5 shield power? That seems pretty good unless I'm missing something. As an added bonus, since I have the shield and deflector this would complete the 3 part set although the Unstable Tetryon ability it grants doesn't seem all that impressive. Especially since it disables your weapon stabilizers. Good turn rate and +2.5 to shield, engine and aux power. Not bad. High turn rate and reduces cooldown on shield and hull healing boff powers. The reduction is however based on engine power so not sure how much help it will really be. On the plus side, I already have it so saves some dilithium there. Any insight and suggestions would be greatly appreciated! You use APA, that means you definitely should use the Rom Engines, bar none. the attack pattern bonus is the ONLY real dps bonus you can get on ANY engine. That makes it significant. -- power at low levels on most gear add +0 to established, well geared players. Either Romulan for attack patterns, or KHG for cold start. Anything else, base ENTIRELY on set bonuses. Nothing else really comes into play outside of the 2 I listed above. My generic, all-around favorite combo for various ships is the 2 piece Kobali: Engines and Deflector. The constant self healing is wonderful and negates the issue of bleedthrough dmg (in PVE of course, PVP would be entirely different). The Engines are well performing Engines, esp since you can attain great subsystem power across the board these days. This is more so if you're an Engineer. The Engines also help speed up hull & shield heals. The Deflector is great for repairs. The Kobali 2 piece I have found to work beautifully on various ship types. Cruisers, Escorts, BOPs. The 2 piece bonus is even more important for lighter hull Escorts and most esp BOPs. Escorts may be a little thin on heals and the benefits of Kobali 2 piece lets you save heals for important occasions or for cross-team support. For the typical TAC-oriented BOP, the Kobali 2 piece lets the ship zoom around easily while getting a constant state of heals. Heals are a precious commodity on a lower BOFF skill count BOP so the Kobali 2 piece is a godsend. This is what the Romulan Engines do for my numbers. Edit: It also works well when stacked with tac team conn officers. I confess I'm a bit of a sucker for the Solanae Engines. 25% speed when engines are offline. Bonus Weapon and Aux power. 5-stack movement buff when you get hit(it's like having a second Pilot spec). Otherwise, Rom engines are great for Tacs if you're simply looking for more damage. I think the Omega and Counter-Command engines deserve a shout. While not great in themselves, they are hyper-impulse engines which works well in the current power-swamped environment. They also contribute to the damage/defence bonuses you can get from the respective 2-pc sets while allowing you to run a stronger shield (which IMO means elite fleet, KHG or Dyson). im still stuck on the old borg set. i have all the other sets and i try them out every one of them. but survivability for me at least always goes down. which takes me back to the old standby borg set. even after they nerfed it to hell which i did see a noticeable effect from. it still works better for me. on a battle cruiser that is. on a BoP i still go back to honor guard set again for same reason as the borg. i tried the others and it still works best for me and my playstyle. so if this thread says anything its that " what works for one may or may not work for another so use what works for you." Thankfully we have not yet gotten to the point of a I WIN BUTTON its damn close with fed traits but still not there just yet. so we can still say no one thing is clearly the best at everything. Trophies for killing FEDS ahh those were the days. Like the above poster stated, I still find myself going 2pc Borg + MACO or 2pc KHG + defector of choice. One one toon I am running the Jem Hadar 2 pc though. The engines are OK.
Jem engines give +5 to weapons, they're not bad for polaron users. Nukara's an underrated set, and the deflector dish from that set is the best reputation deflector I've seen for my build. No nonsense, no stats wasted on things I don't use, just a great defensive piece of equipment. It even has some Structural Integrity on it, which the Aegis dish lacks. I'm using the Nukara deflector and shield, and the Assimilated Subtranswarp Engine from Omega rep as my impulse engine. That engine doesn't have any gimmicks to recommend it in combat space without the rest of its set, but in sector space its ability to break the Warp 10 speed limit without that irritating Fleet Engine sound is invaluable to me. im still stuck on the old borg set. Same here. Borg deflector + Borg engine + Elite Fleet Shield is generally my tried-and-true default combo for most of my builds. It's a great all-rounder set. Has anyone trying any of the 2+2 combinations? 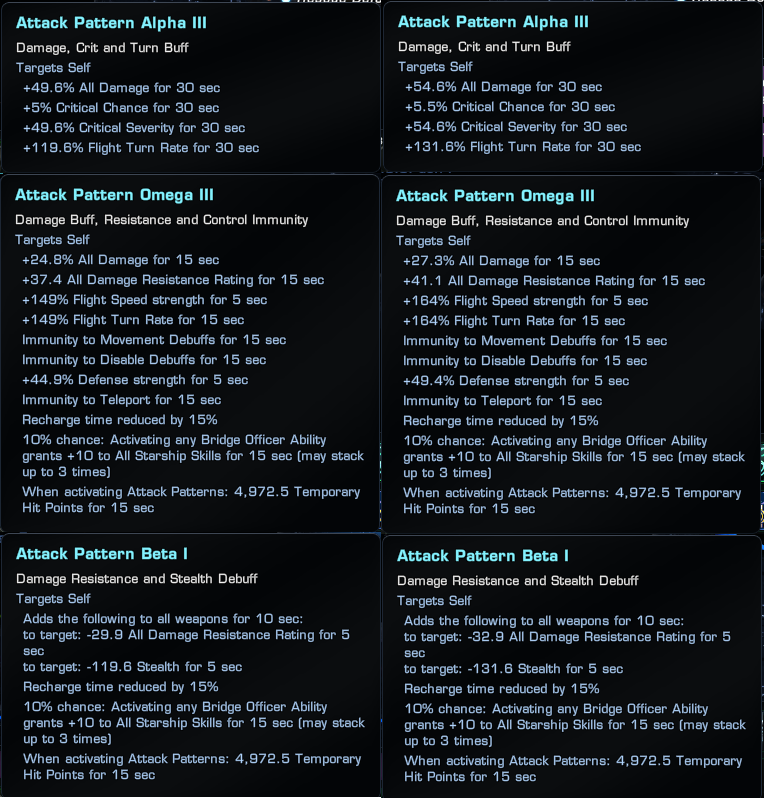 I recently combined a 2pc Assimilated + 2pc Kobali on a T5-U Fleet TER to good survivability results, building around speed +regen to keep me up on a 2x APO build, and it still has more than enough 'pop'. I run a 2 + 2 set using the KHG engines/shield with the counter command core/deflector for a torpedo bomber I have, gav torp, bio torp, only none photon I have on it is the crafted particle torp. Along with a couple of other weapon/console set bonuses there's quite a bit of +photon/torp stackage in there. 1. Having to stuff in a special/reputation warp/singularity core. A lot of those cores are trash. Delta Warp Core for instance has attributes that nerfs itself and it goes completely against the style of the set. None of them have the all important AMP when you get them brand new. Not all of them even get AMP on their rarity upgrades (like Obelisk Warp Core). These same type of cores also tend to be very costly to upgrade. Solanae Warp Core for instance is amazing at Epic quality but getting to there can break you unless you got extremely lucky or have tons of resources to throw at the problem. 2. Contrast that to Elite Fleet Warp/Singularity Cores. AMP right out of the box and key stats that you pick out from the Fleet Store (for most parts). They tend to have more stats that make more sense compared to a bunch of the Reputation/Special Set Cores that have stats that make no sense in synergy to the sets they belong to. Stuffing on a special/reputation core with very questionable stats, very costly upgrades for the sake of a bonus is a bit much to ask. I'm sure there are builds that one can do it and make it work well. But unless I have some Epic special/rep core with AMP on it with the stats I want (like Epic Solanae), I'm quite loathe to use them in place of my Elite Fleet cores.